From the 13-17 November, Lancaster University students celebrated Global Experiences Week, a new initiative by the University and the Lancaster University Students’ Union to foster global perspectives. By bringing global food, music, dance and languages to the campus, as well as promoting vacation travel and study abroad opportunities, the Global Experiences team aimed to encourage as many students as possible to embrace the global opportunities the University has on offer. 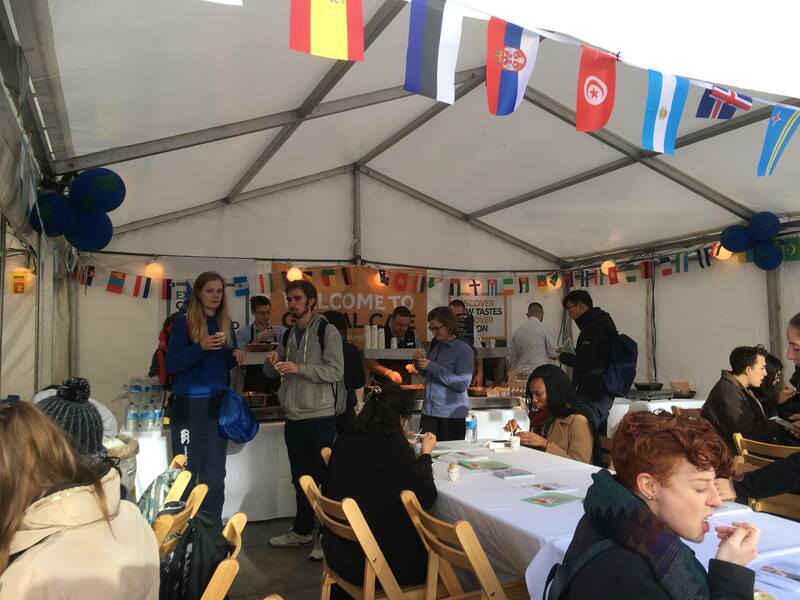 Over three days, the colleges and Alexandra Square brought students international cuisine and culture. Amidst various activities were Mandarin language and culture lessons, Chinese arts and crafts sessions, international-themed pub quizzes and an American-themed breakfast in Lonsdale and Fylde. 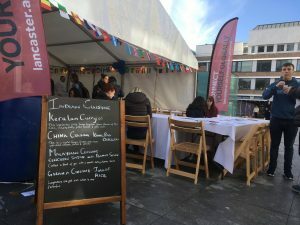 The centrepiece event was the Global Café in Alexandra Square, where students and staff could sample cuisines from India, China, Malaysia and Ghana, whilst watching performances from campus societies and groups. Global Experiences Week also exposed students to employability skills, which, in a globalised labour market, are becoming increasingly necessary. Students had the opportunity to complete an online training module in Intercultural Competency, worth 5 Lancaster Award points, and attend a careers workshop on Enhancing Global Skills, run by the Management School. It was officially launched by the Vice Chancellor and the Students’ Union on Friday 10 November, after the signing of the Universities UK mobility pledge. The week also coincided with International Education Week, an international event that ‘celebrates the benefits of international education and exchange worldwide’. This is a joint effort made by the U.S Department of State and the Department of Education, aimed to produce future global leaders both in the US and abroad. One of the societies involved with Global Experiences Week was the Advertising Society (AdSoc), who hosted a “Guess the Global Ads” quiz alongside the Global Café in Alexandra Square. Kelsey Robb, President of the Advertising Society said: “advertising has to have a global mentality, and so AdSoc has to have one. Global Experiences shape us for the better, make us more culturally aware and give people such an insight into differing perspectives. My team is incredibly diverse, and it helps with the different adverts they bring to the table, and helps shape our events so that they are appreciated by people of all backgrounds”. With the increase in globalisation, Lancaster University arguably needs an increasingly global outlook, with144 partner institutions worldwide, an international community that boasts current students from more than a hundred countries, and an alumni network in 183 countries.